I read a recent article on the Atlantic Cities website that provoked some reflection on the areas of town affected by the future South Mountain Freeway -- specifically Laveen and Ahwatukee -- you know, because of all the discussion about sorely needed economic development that the freeway promises to bring. The article focuses on a recent study released by the Brookings Institution that explores the growth in suburban poverty rates in the US and offers reports on most metro areas, including Phoenix. While I've heard plenty of anecdotal evidence related to Section 8 housing and otherwise, I wondered if there was a better way to assess this issue as it relates specifically to Laveen and Ahwatukee, and then recommend a plan of action. 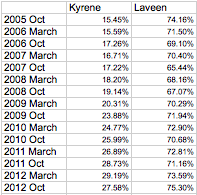 While the Laveen schools have held somewhat constant over recent years, Kyrene is now servicing almost twice the number of students who qualify for free and reduced lunches. I can only imagine that this creates plenty of additional stress for the district, which has not historically taken on such a great responsibility (*in addition to educating our youth). More importantly, this illustrates the fact that we have neighbors in both Laveen and Ahwatukee who likely need economic security resources, which are not yet easily accessible in these areas. Our recent population growth has meant that the population numbers were not there to support the need for those resources as recently as five or ten years ago. This is potentially problematic going forward, especially in light of existing challenges our local non-profit behavioral health providers have faced in trying to serve these populations (if you've attended public meetings in recent years, you've likely seen representatives from Southwest Behavioral Health Services and/or others desperately reaching out to our community). But this is apparently to be expected. As Luis Ubiñas, the president of the Ford Foundation, put it... "Today's poverty is no less painful. But it looks different." There is a land-use component to the shape of poverty (and the kinds of solutions we can build to address it): Poor people who are spread out from each other, and from the kinds of services that grow up to serve concentrated poverty, have the least resources of all. The article continues, noting that suburban populations are much more car dependent than urban populations, regardless of income. This "dramatically changes their relationship to each other, to services, to job opportunity." So, how do we best address this growing challenge? We need to bring the resources and dependent populations closer together. On one hand, this means increasing access to public transportation in Laveen and Ahwatukee -- we really should strive to become less car dependent. However, we have seen slow progress in this regard thus far, and I wouldn't expect major advancements in the near term. Therefore, we need to literally bring the requisite resources closer to the populations that need them and also bring better jobs into our community. So far, the only economic development tool I've seen that can make this a reality is the same one that will bring more retail and healthcare to the area: the Loop 202 South Mountain Freeway. I am open to other suggestions, but have yet to see a comprehensive plan that helps in a meaningful way as urgently and completely as the freeway promises to help. The metropolitan-level strategies could focus on measurable outcomes that are judged to be most important for the economic advancement of lower-income populations in that metropolitan region. 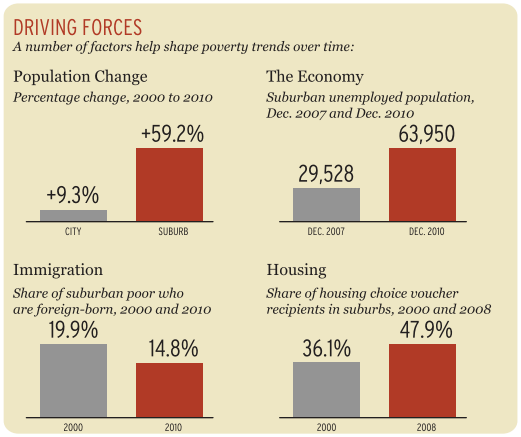 The goals of these interventions could include, among others, locating more affordable housing near good jobs or high-quality schools; stimulating economic development along key corridors that span distressed urban and suburban communities; scaling the delivery of social and health services to reach underserved areas; or coordinating the provision of workforce training and child care to help more adults prepare for in-demand careers. Here's a final thought: Please review this graphic, which I've shared previously, from the Loop 202 EIS. It highlights projected population growth and overall economic growth in our region. And then please take a look, below, at the primary drivers of suburban poverty in Phoenix, and consider how many more members of our community we want to leave feeling isolated and helpless, without the services we need here. I vote for zero -- let's start moving forward now, before we fall hopelessly behind.